^ McGlashan, p. 16; Stewart, p. 271. ^ Enright, John Shea (December 1954). "The Breens of San Juan Bautista: With a Calendar of Family Papers", California Historical Society Quarterly 33 (4) pp. 349-359. ^ Rarick, pp. 18, 24, 45. ^ a b Rarick, p. 47. ^ a b c Rarick, p. 69. ^ a b Rarick, p. 17. ^ a b Rarick, p. 18. ^ a b c Andrews, Thomas F. (April 1973). "Lansford W. Hastings and the Promotion of the Great Salt Lake Cutoff: A Reappraisal", The Western Historical Quarterly 4 (2) pp. 133-150. ^ Stewart, pp. 25–27; Rarick, p. 58. ^ Rarick, pp. 67–68, Johnson, p. 25. ^ a b Stewart, pp. 40-44. ^ a b Stewart, pp. 54–58. ^ a b Rarick, pp. 78–81. ^ Downey, Fairfax (Autumn 1939). "Epic of Endurance", The North American Review 248 (1) pp. 140–150. ^ a b Stewart, pp. 67–74. ^ a b c d "Roster of the Donner Party" in Johnson, pp. 294-298. ^ Johnson, p. 49, McGlashan, p. 66. ^ a b McGlashan, p. 67. ^ a b Rarick, p. 136. ^ a b Rarick, p. 142. ^ a b Johnson, p. 62. ^ King, Joseph A., Luis and Salvador: Unsung Heroes of the Donner Party, The Californians, Vol. 13, No. 2, p. 21. ^ Weddell, P. M. (March 1945). "Location of the Donner Family Camp", California Historical Society Quarterly 24 (1) pp. 73-76. ^ a b Rarick, pp. 241-242. 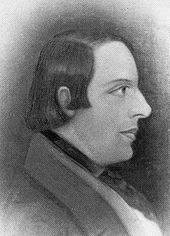 ^ Reed, Virginia (May 16, 1847), "Letter to Mary Keyes", published in Stewart, pp. 348-362. ^ Browne, J. Ross, excerpt from "A Dangerous Journey" (1862), published in Johnson, pp. 171–172, and Johnson, p. 170. 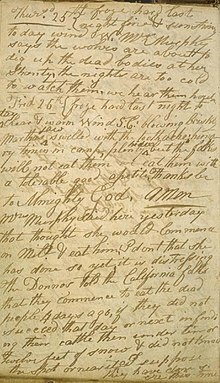 ^ Graves, Mary (May 22, 1847), "Letter from California", published in Johnson, p. 131. ^ Hardesty, p. 3, Johnson, pp. 8–9. ^ State of California, p. 43. ^ State of California, p. 44. ^ State of California, p. 45. ^ State of California, p. 39. ^ State of California, p. 59. ^ a b McCurdy, Stephen (1994). 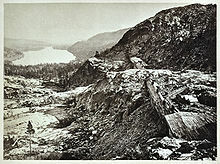 Epidemiology of Disaster: The Donner Party (1846–1847), Western Journal of Medicine, 160, pp. 338–342. ^ Farnham, Eliza, excerpt from California, In-doors and Out (1856), published in Johnson, pp. 139-168. ^ Johnson, p. 164., Rarick, p. 213, King, pp. 86-87. ^ Wise, H. A., excerpt from Los Gringos (1849), published in Johnson, pp. 134-135. ^ King, Joseph; Steed, Jack (Summer 1995). "John Baptiste Trudeau of the Donner Party: Rascal or Hero? ", California History 74 (2) pp. 162-173. Bagley, Will (2010). So Rugged and So Mountainous: Blazing the Trails to Oregon and California, 1812-1848. University of Oklahoma Press. ISBN 978-0-8061-4103-9. Hardesty, Donald (1997). 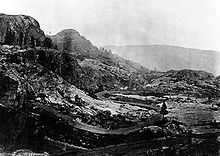 The Archaeology of the Donner Party. University of Nevada Press. ISBN 0-87417-290-X. Johnson, Kristin, ed. (1996). 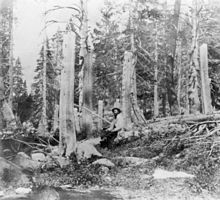 Unfortunate Emigrants: Narratives of the Donner Party. Utah State University Press. ISBN 0-87421-204-9. King, Joseph (1992). 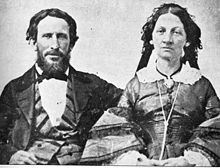 Winter of Entrapment: A New Look at the Donner Party. P. D. Meany Company. ISBN 0-88835-032-5. McGlashan, Charles (1879). History of the Donner Party: A Tragedy of the Sierra Nevada (11th edition (1918) ed.). San Francisco: A Carlisle & Company. McNeese, Tim (2009). 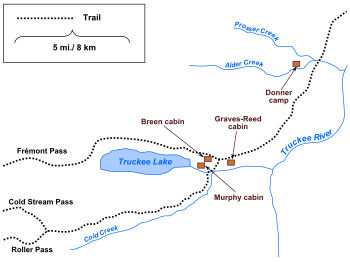 The Donner Party: A Doomed Journey. Chelsea House Publications. ISBN 978-1-6041-3025-6. Rarick, Ethan (2008). Desperate Passage: The Donner Party's Perilous Journey West. Oxford University Press. ISBN 0-19-530502-7. Rehart, Catherine Morison (2000). The Valley's Legends & Legacies III. Word Dancer Press. ISBN 978-1-884995-18-7. Stewart, George R. (1936). Ordeal by Hunger: The Story of the Donner Party (supplemented edition (1988) ed.). Houghton Mifflin. ISBN 0-395-61159-8. Unruh, John (1993). The Plains Across: The Overland Emigrants and the Trans-Mississippi West, 1840-60. University of Illinois Press. ISBN 0-252-06360-0. The Donner Party Chronicles: A Day-by-Day Account of a Doomed Wagon Train, 1846?1847 by Frank Mullen Jr.